Yesenia Lopez was born and raised in Chicago’s Pilsen neighborhood, a predominantly Latino neighborhood. 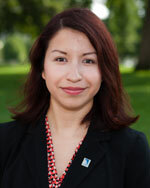 Growing up in Pilsen, she developed an interest in immigration, social justice and education policy. This prompted her to pursue a B.A. in political science, which she received from DePaul University with a minor in women & gender studies. During her undergraduate career, Yesenia interned in electoral campaigns and joined the Community Partners Intern Program through DePaul University’s Stean Center. She then went on to participate in Americorps Public Allies Chicago where she was placed at Telpochcalli Community Education Project (Tcep). Recently, Yesenia worked as the 21st Century CCLC site director with General Wood Boys and Girls Club and Spry Community Links High School in Little Village. As a CHCI Public Policy Fellow, Yesenia hopes to learn more about policy making and the legislative process so that she may go back to Chicago as an effective and resourceful leader for the city’s Latino community.